For 2009, the diesel-powered X5 xDrive35d, with a slick new diesel engine that's as clean as any of its gasoline counterparts, joins the lineup. The diesel improves mileage nearly 25 percent compared to the six-cylinder X5 xDrive30i, yet it accelerates more quickly and tows more. 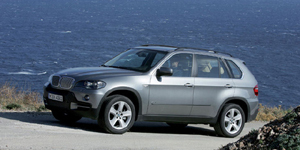 In addition, the nomenclature is changed to reflect that all X5 models features xDrive all-wheel-drive.